Do you remember being a child and receiving a birthday card in the mail from a relative? It really was the best. Whether it was a card, stuffed bear, balloon, or stickers, it didn’t matter. What mattered was that someone remembered that it was your birthday and took the time to let you know. In the world of social media, sending actual items through the mail or making a simple phone call can seem burdensome. It’s so much easier to just send an e-card or “Happy Birthday” message on someone’s timeline, but it doesn’t quite convey the same feeling. Now don’t get me wrong, the Facebook birthday reminder has saved me many times with both friends and family birthdays. Goodness, with 1,000+ friends (plus their children at that), it is nearly impossible to remember everyone’s special day. Yet, of those 1,000 or so acquaintances that we keep up with via social media, there are some that fill a more special place in our lives. Those are the people who belong on a different calendar. With Mother’s Day just around the corner and few birthday’s learing in the upcoming weeks, it seemed to be the ideal time to add the Celebration’s Calendar Template to our Home Management Binder Template Series. This template is the ideal place to store special dates such as birthday’s, anniversaries, holiday’s, and other special events. Keep this calendar in a visible place as a reminder when birthday cards or presents should be sent out or delivered. If you are newly married (like us), this kind of template is definitely a must to make sure that you don’t forget any of your spouse’s family members birthdays. For each month, chronologically display the event (i.e. Mom’s Birthday – April 4)and event date. Another helpful item to include is the person’s favorite stores or places to go. That way, if you can’t come up with a present idea, you can always send a gift card. We also like the idea of color-coordinating items. For our family’s celebration calendar, family birthdays are a different color than friend’s birthdays, anniversaries are a different color than holidays, etc. Anything that helps to distinguish and clarify what’s coming up tends to be the most helpful in our household. 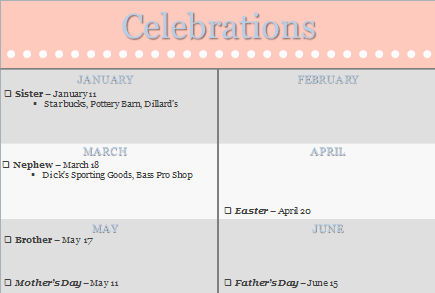 The Celebration Calendar Template below follows the same color scheme as the other templates in the Home Management Binder. The picture below outlines January – June, but the full template goes through December. Depending on the number of celebrations that your family is a part of each year will dictate how much space you need for each month’s section. We only include birthday’s that we actually purchase presents or cards for, but you might want to include additional people as reminders. This template is aimed at helping to make your life easier so what is best is whatever is best for your family. To all the mother’s out there, we hope that you have the best Mother’s Day to date. There’s not enough love and gratitude in the world for those special ladies who have made us into the people that we are today.